Psychologist Simon Baron-Cohen developed the "empathizing-systemizing theory" in the 1990's which essentially classifies a person as either an empathizer or a systemizer, or some value in between. An empathizer has the ability to empathize with other people, while a systemizer likes to build systems. Simply stated, he theorizes that autistic behavior can arise from a person that has a low empathy quotient and an extremely high systemizing quotient. From a physiological perspective, the discovery of "mirror neurons", and malfunctioning thereof, in autistic people, seem to support this theory. A "hypersystemizer" is someone that is on the extreme end of systemizing on the ES spectrum. I am a hypersystemizer, but I'm not autistic. 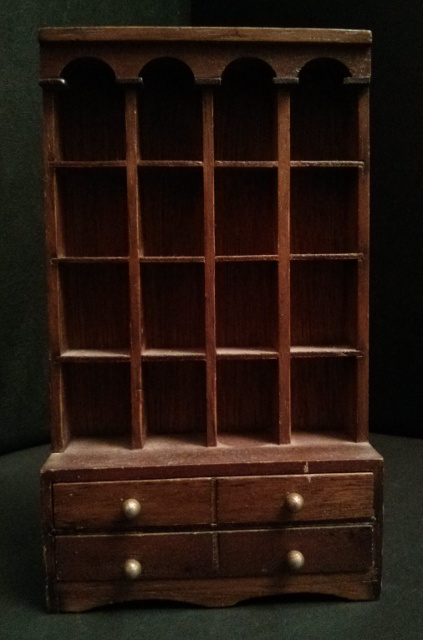 At an early age, I became both obsessed with and addicted to knowledge, a cycle driven by OCD in my father's family line that I internalized instead of manifested externally. The beginning of the home computer revolution in the 1980's which I grew up with reinforced this. I could not define it for most of my life, and only recent research in hypersystemizing, mirror neurons, OCD, have led me to uncover this. In fact, if I wasn't a hypersystemizer, I probably wouldn't have the capacity to detect it within myself, so it is, in a weird way, self-balancing. What this means is that I can "see" into the autistic world, and share many of the same interests (as this web site should have made evident), but since most of my mirror neurons have not been claimed by my systemizing mind, I also understand and empathize with people normally. I can "turn off" the systemizing part of my mind and let the other one surface. I don't like to turn it off, as I feel that I've lost my superpower, but I can if the need arises. It is actually very easy to do, since the systemizing part of my mind is extremely responsive, being my primary tool. But it makes me feel vulnerable, since raw information can then affect me. I feel very "dumbed down" when I do this, since it's also where a lot of my tools reside, so when the shields go down, I can't maintain complex conversations or tap into my unique memory structure without turning it back on. I think a lot of people can do this, but because of the distinct separation of my "thought engine", I can do it very quickly. My systemizing mind is like a virtual machine running on a computer, it's not my conscious mind, but a smaller, more focused hyperconscious, a layer my conscious mind has crafted and shaped over years to do its logical thinking. So I, in effect, abstracted my thinking, in the same way I learned how to abstract computer programs. It's like I created a piece of technology in my head, and use that technology in lieu of my natural thinking. When I shut down this machine, my conscious mind is still there, but it is quiet and bored, like suddenly turning off a television that was running all day long. I don't like to keep it turned off and will usually run it until I fall asleep. If I'm out running, though, I may intentionally turn it off, since I want to pay attention to my surroundings. If I try to meditate, I must turn it off, as it interferes. When I write, I also must switch it off and on frequently, since I have to put my mind in the viewpoint of the reader. My art is created with it turned off. In fact, I cannot create any reasonably good artwork with it turned on, since it filters out information from the art. So what I'll do is use my systemizing mind to layout the structure of the artwork, then turn it off and use my normal mind to fill in the details, as it is closer to the subconscious. I know all of this sounds like something out of a Michel Gondry film, but in many ways, like a messenger or translator, I feel like a hybrid in a very lonely place, another part of being InTheDoorway. And systemizing is a very lonely practice, since I don't experience things in the normal sense. When I do something, or see something, I pay more attention to how things operate rather than take away feelings from the event. The first things I notice when I walk into a room is the structure of the room, the machines, the placement of people. I quickly abstract away details and look at structure, then compress the experience into a system model, packed tightly away in the corner of my mind. The problem is that the details of the experience and some of the memory and feelings, are hidden away, and some are even lost due to this abstraction. To "extract" them, I have to reconstruct my system model and replay the events. So I'm usually not living life in first person, in present moment, but in 3rd person. It's like a person who writes down all of their experiences as they are happening in a little notebook, capturing statements of the events, but not the actual experience. My experience engine is kept at low idle, and rarely do I engage it. I am the total opposite of an adrenaline junkie. A side effect of storing structure is that my facial recognition skills of static faces (like photographs) is slightly below average. I have a hard time recognizing a picture of someone whose facial features are common, but can easily recognize faces with exaggerated features. If a person ages or changes their hair, a common face will look completely different to me. But if I see a person talk or move, or if I can walk around them briefly to see their face in the third dimension, I can lock onto a higher pattern which transcends this. So I generally wait until I see someone talk or respond to me before confirming that I know them. Below is an example of some of the things I used to do before I realized I was hypersystemizing. 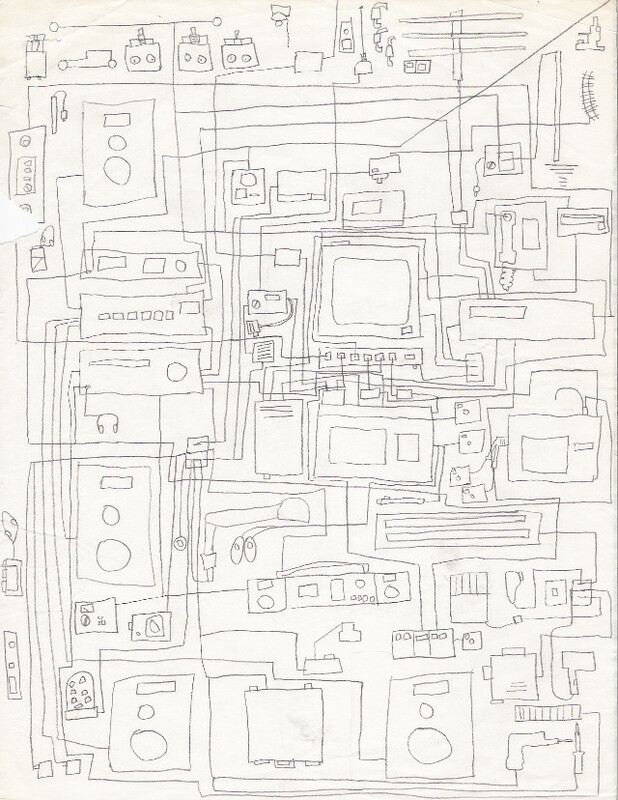 I created a drawing of all of the electrical devices and wiring in my room when I was a teenager. It allowed me to see an overview of the entire room's electrical systems so that I could optimize them.